Have you ever made homemade pudding? Pudding is a simple and easy make-ahead dessert that’s a world apart from pudding in a box. The butterscotch flavor is almost subtle, the texture is super creamy, and the “optional” bourbon is the perfect match for the caramely-butterscotch flavor. Butterscotch, made with brown sugar, is a close cousin to caramel which is made with granulated sugar. 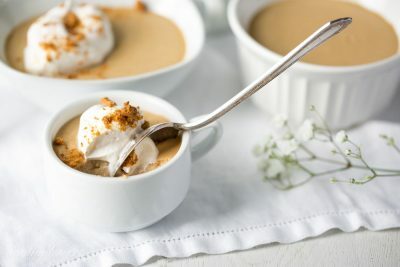 This Butterscotch-Bourbon Pudding sets up a little thicker than the ‘not from scratch’ version and the wonderful fresh taste makes a noticeable impact. 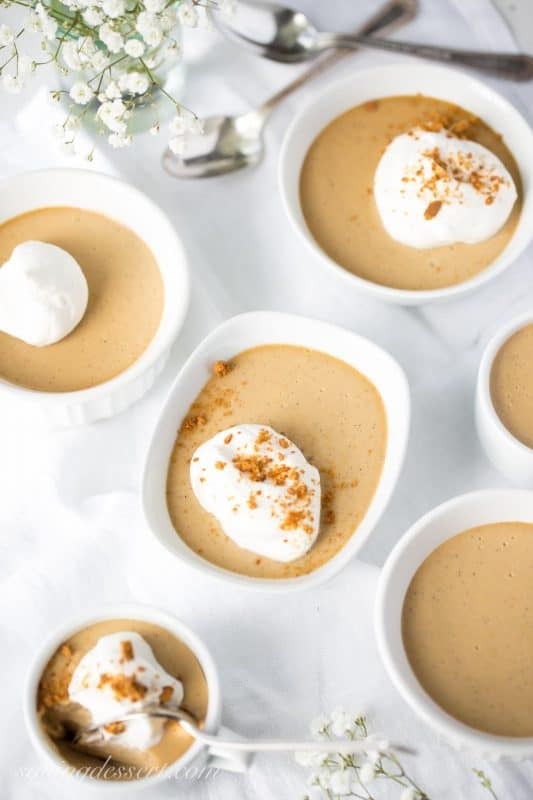 Topped with a little dollop of bourbon whipped cream and crushed Ginger Snap cookies, Butterscotch-Bourbon Pudding is a perfect anytime dessert. Not a fan of bourbon or afraid the kids will enjoy it a little too much? Omit the bourbon and serve the kid-friendly version with confidence. The recipe can be made a few days ahead for that ‘no pressure’ entertaining. 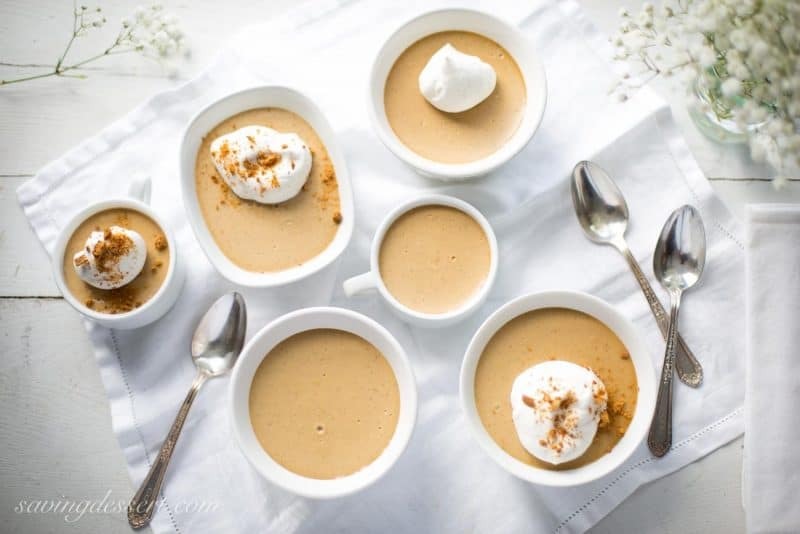 An easy, make-ahead creamy butterscotch pudding spiked with a little bourbon and topped with sweetened cream and crushed ginger snap cookies - delicious! Do you listen to music when working in the kitchen? I love Pandora and often enjoy a wide variety of music depending on what I’m making – like background music in a movie. If you could have a theme song that played as you went along with your life, would it be rock, classical, country, pop or religious? I think I’d have mostly instrumental music, with lots of strings. Funny how music can change your mood or set the scene for an event or party. Not sure where that came from but I love to listen to music while blogging, baking, working around the house and especially when walking on the treadmill. I wish I was brave enough to give up cable TV – how much we could accomplish without the time spent in front of the flatscreen! Hope you have a wonderful weekend – we’re supposed to get another snow-rain mixture tomorrow night – so winter’s not done with us yet. Muna that is the sweetest comment ever! Thank you so much 🙂 And thanks for stopping by. Hope you have a great weekend. Thank you Tamara! Hope you give it a try! Hi Tricia !! 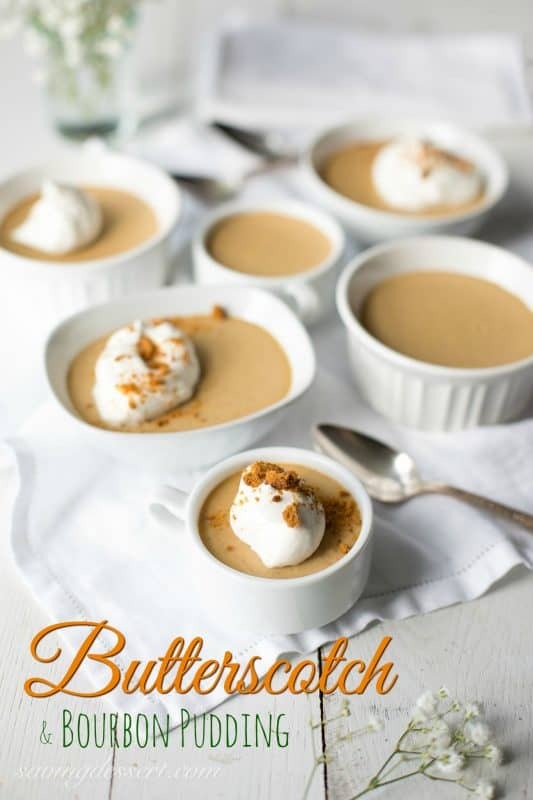 We love butterscotch pudding and the addition of flavor and ginger snaps is genius- love te photos too! Hey ladies! So great to hear from you – hope you are both doing great. This is a terrific dessert and easily made ahead. Hope you get the chance to make it soon 🙂 Have a great week! Thanks Greg – This pudding really is much to easy to eat! These look gorgeous. I have a similar pudding that I make with Scotch whiskey. Delightful! Scotch whiskey goes well with butterscotch for sure! Thanks Beth – hope you have a terrific week. Scott and I went to a really nice restaurant last weekend and ordered their butterscotch pots de creme for dessert. It honestly wasn’t great. I told Scott that I thought I could make a better version – it looks like you definitely have Tricia. It looks so smooth and creamy! Thanks Chris – gotta love recipe research! Hope you are having a great weekend. This sounds awesome Tricia. I assume you wrote “optional” beside the bourbon for those who wanted to use more than a tbsp. Thanks Larry – you really cracked me up! I love both pudding AND butterscotch. These smooth little puddings made me hungry the moment I saw them! Thanks for explaining the difference between caramel and butterscotch! Never having made butterscotch, I had no idea about the different sugars used. Have a good weekend! Thanks Wendy – these are pretty terrific so I hope you get the opportunity to make it! Have a lovely weekend. My family loves pots de cremes, custards and puddings like this! I love the sprinkle of gingersnaps on top of yours and can almost taste the combo. I love to listen to upbeat but relaxing music so usually have the Dan Hartman radio, Michael Buble, Hall & Oates or Steely Dan radio turned on with Pandora almost every day. I think I know what Monique means about logging in each time. I have to put my Name, Email address and Website each time before I can post a comment on your blog. Not sure why some places the information is saved and some sites don’t. Thanks for the feedback and comment Susan. I have been looking into the comment thing 🙂 Sometimes I think the combination of widgets, versions, plug-ins and such just make for a funny soup. I’ll be in touch if I figure it out or better yet find a more experienced mind to tell me! I make a pudding really similar to this and I got to tell you-I would give up chocolate if someone put this in front of me each day. I love licking the spoon slowly and savoring the richness. Pudding always seems so special! It would be hard to pick between butterscotch and chocolate! This has a lovely flavor and eating it slowly “savoring the richness” is the perfect was to enjoy this pudding. Have a great weekend Abbe – thanks for the great comment! I was brought up on pudding and enjoy eating it. Your butterscotch pudding looks delicious. I know just the person I should make this for, my dad he loves butterscotch pudding and this must be extra delicious. I hope he loves it as much as we did Diane – enjoy! I love your presentation in the different bowls and cups. And the final touch of gingersnaps is just the textural contrast and finish to make it really special. Who doesn’t love a make-ahead for a dinner party or meal that is also impressive. It looks wonderful. Hope you don’t get too much snow!! Hang in there – Spring is coming!! Thanks so much Monica! This was fun to make – and even more fun to eat. Can’t wait to try your peanut butter pancakes! What a wonderful dessert and love anything that can be made ahead of time. Thanks Mandy – hope you’re having a happy day too. I’ve never made pudding but butterscotch (from a box) was my favorite as a kid. This is so pretty, Tricia! Love the flavors and the added bourbon is a special touch. I’m all about textures in my food so that cookie topping is the perfect crunch. If you love butterscotch – you should give this a try Robyn. It’s a wonderful treat – have a great weekend! I am not really crazy for desserts, but I will EAT anything you cook, Tricia. This looks really tempting! Thanks Angie – I love all your healthy desserts and colorful recipes. Thanks for stopping by and have a wonderful weekend! I love music..and many kinds..I would be hard pressed to pick what I would listen to..I have Spotify..
During the day..I love too many kinds Tricia..from instrumentals..André Gagnon etc..
to Tony Bennett to classical..to Gonna Bake You a Pie w/ the Heart In the Middle..
Have to ask you something..is your blog hosted by the same host as Chris..Café/Sucre/Farine? Can you email more details when you get a free minute Monique? Not sure what you mean about logging in. You should not have to sign/log in to post a comment. We are both on WordPress but I don’t know who is hosting her site. I am with BlueHost. I’m having some work done today – they are probably in there messing around. So sorry it has caused you trouble – please email some details so I can look into it – [email protected]. Thanks Monique! I love butterscotch so much but have all but forgotten about it. Thanks so much for reminding me of this delicious flavor with your gorgeous photos. Thanks so much Karen – I wish I could make butterscotch candy – always been a favorite. Have a wonderful weekend and thanks very much for stopping by! Hi Tricia, I have never made a pudding, but after looking at your pics and reading your description I’m going to have to make this. We are having a heat wave in Phoenix, supposed to get up to the low 90’s today, too soon. Wow – that is hot already. Crazy weather this year. You will love making pudding – it’s so easy and such a delicious treat. Have a wonderful weekend Cheri! We’re kinda on the same page today, this looks incredibly creamy! Butterscotch pudding (from the box) was always my dad’s favorite, so I’ll make this for him next time I’m in Florida! We are on the same page Sue – but mine doesn’t have beautiful flowers – I love your edible flower posts and jealous of your spring weather. Have a great weekend! Butterscotch pudding is one of life’s true pleasures. Love yours, with the bourbon and the cookie crumbs. Must try it! Pinned! I have learned something new about you Jennifer – you’re a rock and roll kinda of girl. I love Queen – but I need to stay calm in the kitchen so no rock and roll – haha. Have a great weekend and stay warm!